Various life cycles that a bug passes through during a software testing process have been described in this article. Take a look. 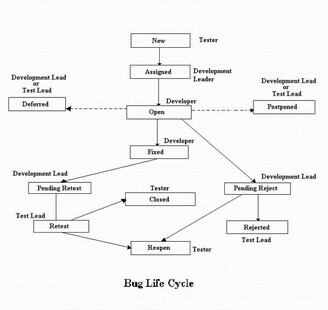 The duration or time span between the first time that the bug is found is called 'New' and closed successfully (status: 'Closed'), rejected, postponed or deferred is called 'Bug/Error Life Cycle'. Right from the first time any bug is detected till the point when the bug is fixed and closed, it is assigned various statuses which are New, Open, Postpone, Pending Retest, Retest, Pending Reject, Reject, Deferred, and Closed. A tester finds a bug and reports it to the Test Lead. The test lead verifies if the bug is valid or not. Test lead finds that the bug is not valid and the bug is 'Rejected'. The bug is verified and reported to the development team with status as 'New'. The development leader and team verify if it is a valid bug. The bug is invalid and is marked with a status of 'Pending Reject' before passing it back to the testing team. After getting a satisfactory reply from the development side, the test leader marks the bug as 'Rejected'. The development leader and team verify if it is a valid bug. The bug is valid and the development leader assigns a developer to it, marking the status as 'Assigned'. The developer solves the problem and marks the bug as 'Fixed' and passes it back to the Development leader. The development leader changes the status of the bug to 'Pending Retest' and passes it on to the testing team for retest. The test leader changes the status of the bug to 'Retest' and passes it to a tester for retest. The tester retests the bug and if it is working fine, the tester closes the bug and marks it as 'Closed'. The development leader and team verify if it is a valid bug. If the bug is valid, the development leader assigns a developer for it, marking the status as 'Assigned'. The tester retests the bug and the same problem persists, so the tester after confirmation from test leader reopens the bug and marks it with a 'Reopen' status. And then, the bug is passed back to the development team for fixing. The developer tries to verify if the bug is valid but fails to replicate the same scenario as it was at the time of testing, and asks for help from the testing team. The tester also fails to regenerate the scenario in which the bug was found. And finally, the developer rejects the bug marking it as 'Rejected'. After confirmation that the data is unavailable or certain functionality is unavailable, the solution and retest of the bug is postponed for indefinite time and it is marked as 'Postponed'. If the bug does not stand importance and needs to be postponed, then it is given a status as 'Deferred'. This was about the various life cycles that a bug goes through in software testing. And in the ways mentioned above, any bug that is found ends up with a status of Closed, Rejected, Deferred or Postponed. Your article about software testing is awesome. It helped me to understand the career prospects in software testing industry. Thanks for helping me to understand basic concepts. As a beginner in software testing your post help me a lot.Thanks for your informative article. people that should have guidance on this important matter.